Wildflower Art: The End of Summer . . . 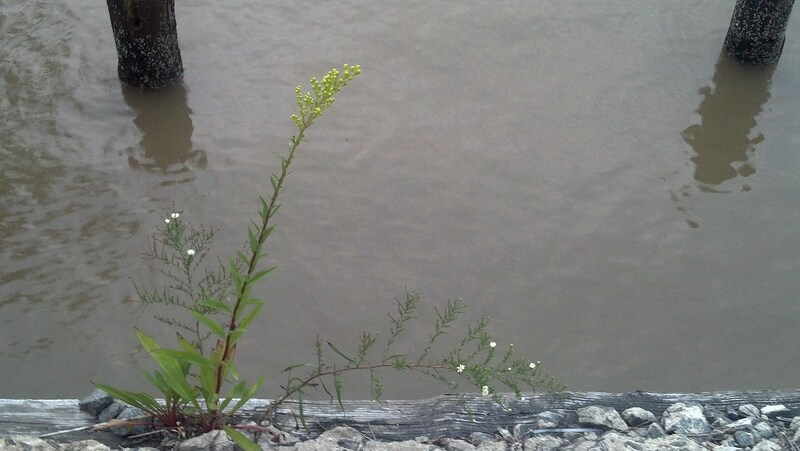 Here a single stem of Seaside Goldenrod (Solidago sempervirens) stands fully budded, gracefully curved, flanked by two strands of Calico Aster (Symphyotrichum lateriflorum) already beginning to bloom. The two pilings encrusted with barnacles at the top and the slate gray strip of sea wall along the base frame the photo in an artful way, perhaps, and add contrasting cool colors, certainly, yet it is the natural symmetry of the living things growing together that held my eye long enough to inspire me to photograph the scene. The image was taken beside the Hudson River near Pier 54 as the sun was setting on September 17, 2011. Both wildflower species I found rooted on the western edge of Manhattan are bellwethers of autumn, which begins in just a few days. Signs of summer’s passing are already visible in the fine details of the big city picture: the tangled undergrowth of courtyard gardens has begun to thin out; brick walls are beginning to show through the ivy; a few tree top leaves are tinged with savory sanguine color. What I discovered on an evening stroll is an especially vivid living symbol of that temporal change in progress: the city and nature intersected, composed by coincidence in a symmetric, aesthetic way emblematic of the season. Separate elements, which when combined transcend the individual and fulfill a working definition of . . . (wildflower) Art. Appreciation for this infomairton is over 9000-thank you!